The curved timber roof of this West Coast-modern-inspired family home makes waves on its riverfront property. The upstairs family room features a curved timber ceiling made of Douglas fir glulam and Kayu Batu wood. Family-room ceiling wood from Kayu Canada; sofa from Montauk Sofa; Rug from Crate and Barrel; Wave art from IKEA. Photograph by Jared Sych. 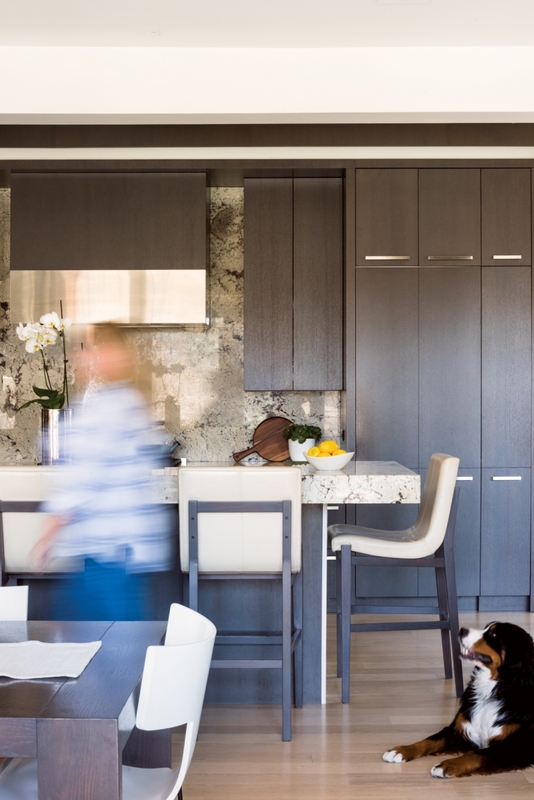 When Michelle and Tyler Armstrong first started working with Marvin DeJong at DeJong Design Associates (DDA) to design their house in Rideau Park, the couple had difficulty pinning down their exact vision. But the design came together once the roof was brought into the picture. The distinctive curved-timber roof makes the West Coast-modern-inspired house a sight to behold from the outside. 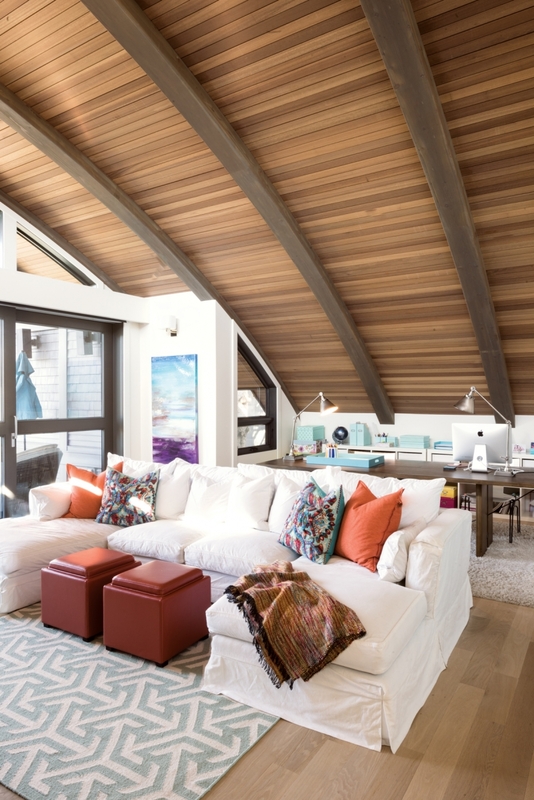 And inside, the wood ceiling in the upstairs family room gives the space a breezy grandeur. Coordination and cooperation were imperative to all parts of the process of creating this home. DDA worked closely with interior design firm McIntyre Bills and general contractor Stonewater Homes to create the Armstrongs’ distinctive addition to the Rideau Park streetscape. McIntyre’s design for the interior of the Armstrong home was inspired by the architecture of the house and the beauty of the Elbow River. Along with his design-firm partner Ronald Bills, McIntyre focused on making choices that would reflect the surroundings rather than draw attention away from them. “We tried to choose furniture that had a strong connection to the architecture – that is, not too decorative, but furniture that looks more like it fits conceptually. When you do that, it allows the eye to enjoy the view out to the water,” he says. Functional beauty was a key concern for both Michelle and Tyler. “There’s a practicality to the Armstrongs. As much as they wanted [the home] to be beautiful, because it’s a busy family home they wanted it to be functional and practical,” says McIntyre. The result is a mix of custom touches and easy pieces. 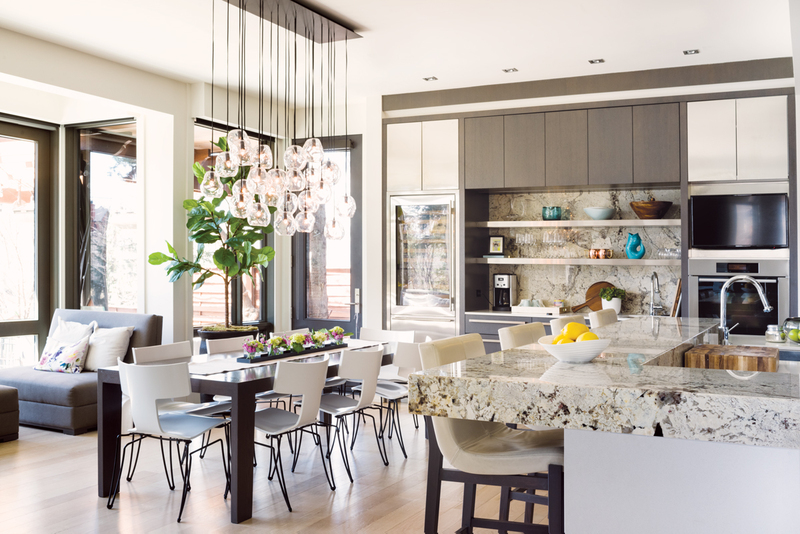 The kitchen features luxurious items like the chandelier, a custom dining table by Red Eight Workshop and a granite countertop and granite backsplash. The second-floor family room is a more relaxed space with wave wall art from IKEA and a cheerful turquoise patterned rug from Crate and Barrel. The mix of the functional and beautiful creates a home where the Armstrongs can run through their whirlwind everyday routine of school, work and extracurriculars, and still entertain family and friends with a touch of grandeur. The silhouette of the curved timber roof is distinctive against the sky. Home design by Dejong Design Associates Ltd.; interior design by McIntyre Bills; general contractor, Stonewater Homes. Exterior photograph by Mike Heywood. An essential component of home design is choosing the right materials. Designer Marvin DeJong prefers to use natural materials wherever possible. “A design tenet is that there’s truth in materials,” he says. 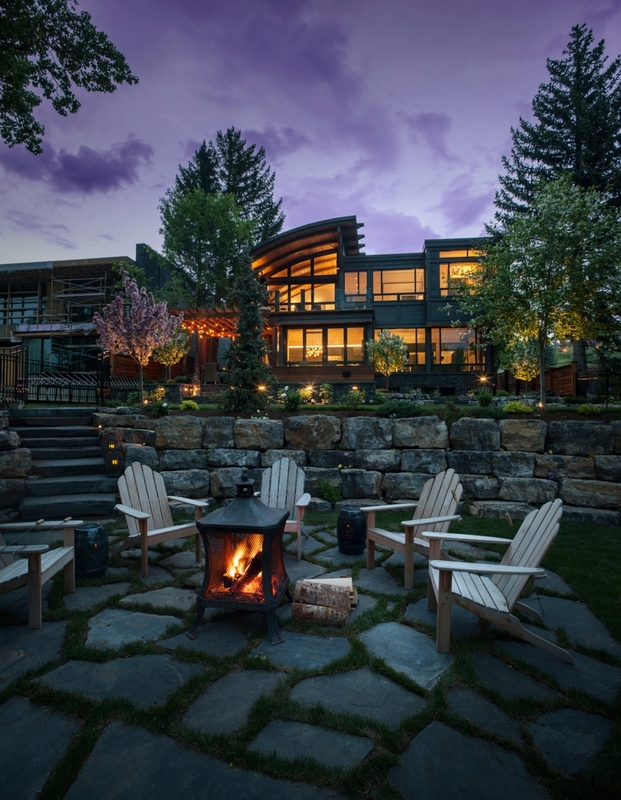 Here are DeJong’s three tips on materials that elevate the design of a home. 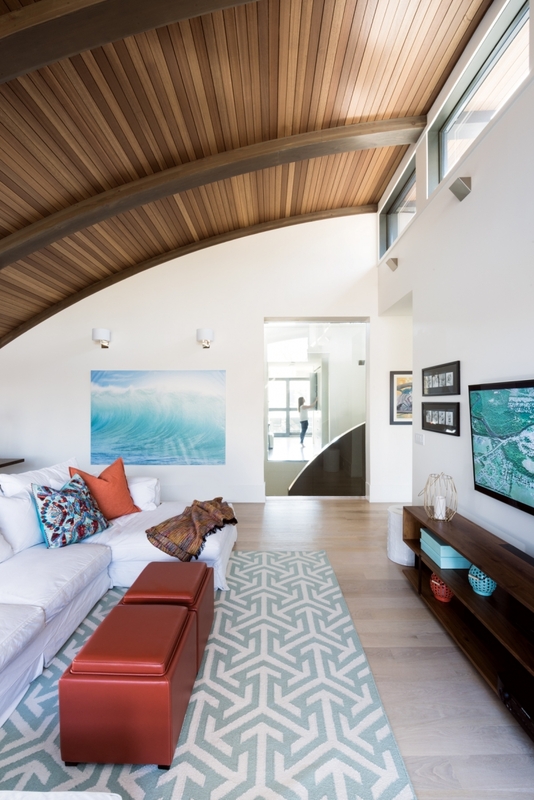 The impressive curved timber roof adds both a distinctive look and a coziness to the space. Desk from Crate and Barrel; Lamps from Pottery Barn Photograph by Jared Sych. The John Pomp Studios hand-blown glass chandelier hangs over the custom Red Eight Workshop dining table, designed to match the home’s millwork. Kitchen countertops from Caesarstone; Wolf range from Trail Appliances; Backsplash from Icon Stone + Tile; Bar chairs fabricated by Red Eight Workshop; Millwork by Bec Woodcraft; Dining table custom made by Red Eight Workshop; Light fixture by John Pomp Studios. Photograph by Jared Sych. The home is an excellent space for entertaining, as well as cooking and baking, which the Armstrongs love to do. The lighter granite countertop and backsplash balance out the darker cabinetry. Photograph by Jared Sych. 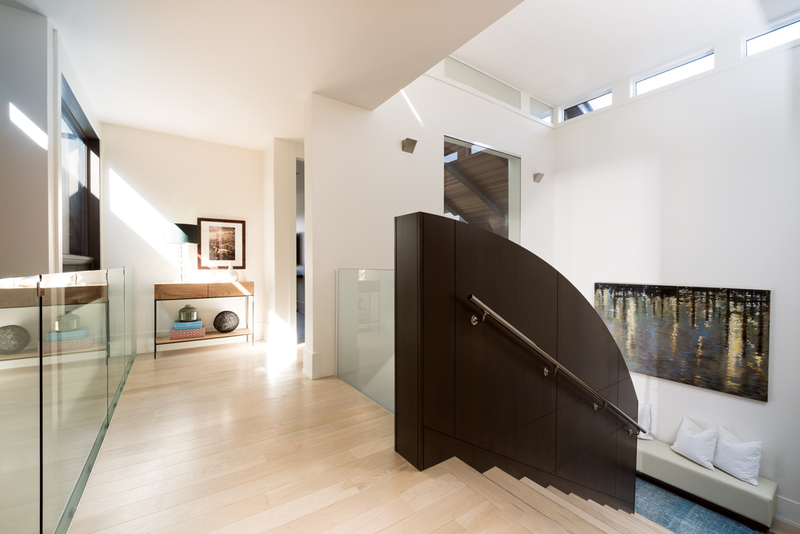 The Armstrong home is full of shapes that are reflective of the architecture, including the curved wall of the staircase leading up to the family room. Photograph by Jared Sych. The mud room is airy and bright with Hicks pendant lighting and ample storage. Mud room tile from Stone Tile West, 4040 7 St. S.E., 403-234-7274; Hicks pendant lights from Circa Lighting. Photograph by Jared Sych.